If your spring vacation is turning into more of a to-do list than a woo-hoo! list, it’s time to stop what you’re doing and make a little room for awesome in your life. We know you have chores, but that doesn’t mean you can’t find balance between spring cleaning and spring vacation! 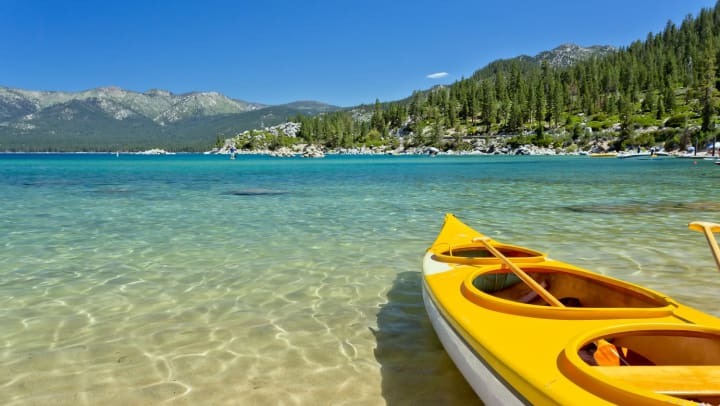 Your stuff matters, and so does your journey, so let your friends at StorQuest help you plan an epic mini-adventure with these five reasons you must make time to visit Reno Tahoe this spring. 1. It’s spring, but winter sports are in full swing! If you haven’t had the chance to get in some serious slope time this winter, now’s the time to do it! The 2018 spring ski season is in full effect, with record snowfall blanketing the area’s top resorts. It’s the best time to get in killer turns under bluebird skies before the season caps off. Check out Opensnow.com for daily snow and weather conditions. 2. Pub crawl season starts early here! Whether you’re a beer sipper or a wine sniffer, there’s a pub crawl for you in the Reno Tahoe this spring. The 90s Bar Crawl in Reno is coming up on April 21, and we can’t wait to rock our flyest fashions from the pre-millennium decade. That reminds me, has anyone seen my Walkman…? 3. The food is awesome! When it comes to making room for awesome, we don’t just mean around the house or in your storage unit. Some of life’s sweetest adventures happen on the wonderland of your palate, so make the most of your spring vacation by savoring the local flavors at these top eateries in the Reno Tahoe area, courtesy of our friends over at Theculturetrip.com. 4. There are so many concerts! Seriously! We can hardly believe the line up at some of these music venues in Reno Tahoe. From the kind of early 2000s hip hop that parents still hate to the sweet and sultry sounds of classic blues and timeless country stars, there’s a show for every taste on the menu this spring. Book your tickets today at Vividseats.com! 5. Fishing is off the hook! Fishing in the Reno Tahoe area is an incredible experience, but being on the border of two states means keeping a close eye on regulations and guidelines. The gorgeous Truckee River is open to trout fishing year round and offers spots for anglers of all skill levels. Here’s what you need to know about fishing the Truckee River. Happy casting! Make More Room for Awesome! The adventurous souls at StorQuest are up for finding new ways to create more space for amazing things in your life, so check back often to learn more about all things awesome in Reno Tahoe and beyond! We’ll help you make room, then make it happen.